Throughout the United States (and the world) there are obvious earthquake zones which regularly receive their share of earthquakes (e.g. US West Coast). While earthquakes aren’t a concern for most people who don’t live near a known active region, sometimes one (or many more) can pop-up unexpectedly. 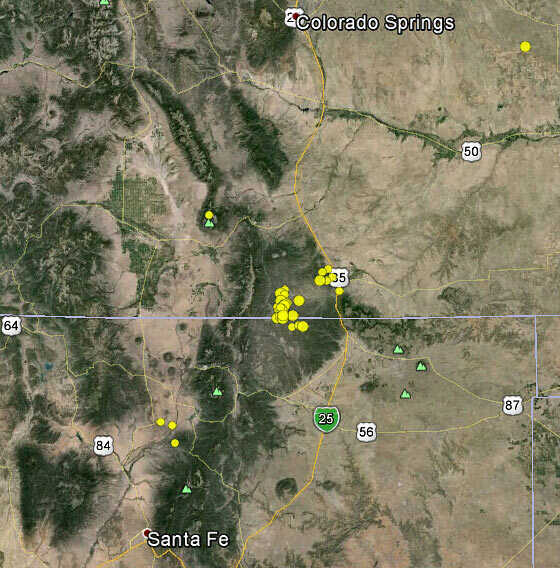 I found it interesting to search for all of the earthquakes which shook in the USA during 2014 (using a USGS database), and converted them to a KMZ file to import into Google Earth for observation and discovery of the active regions. While looking at the state of Oklahoma it appears that there are two major regions of earthquakes. However when zooming in further, sub-clusters become visible. 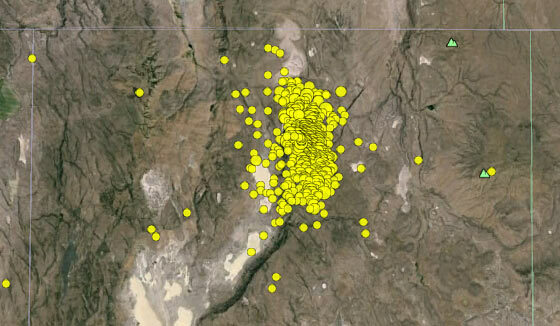 I suspect that many of these earthquakes are caused by fracking. You can literally identify right where it’s happening. Is there anyone reading this who happens to live near any of these regions care to comment? 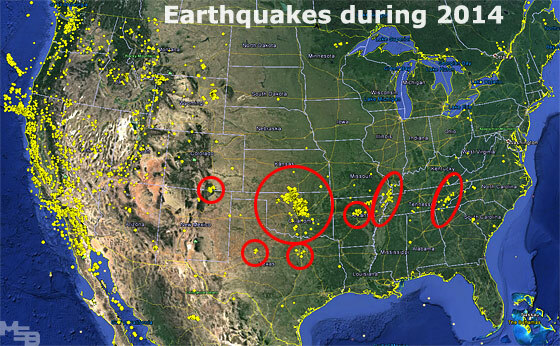 Again, I suspect that the earthquake clusters in Arkansas are due to fracking in the area. There is another cluster around the New Madrid Fault Zone (Arkansas-Tennessee-Missouri). A third cluster in the region of Knoxville appear to follow the Blue Ridge Mountains. Have any of you experienced an earthquake during the past year? Read an article last month (will try to locate) that stated Oklahoma state geologists did, in fact, determine the spate of EQs was caused by fracking. In areas where there is no apparent natural or man-made cause it could be the military messing with HAARP. Wouldn’t HAARP be a man-made cause? I’m about 8 miles south of the epicenter in Irving, at first they blamed fracking then they blamed the dumping of fracking water. After an SMU seismologists did more investigation it was determined that there actually was an active fault line that ran right through the old Texas Stadium area. Ken I’m not sure if you have ever run a article about the active fault lines that are in the US, but it would be interesting to see how many there really are. Save the .223 and the AR-15!!!!!!!! What about all the earthquakes in Alaska in 2014. There is no fracking here. A couple of years ago I reviewed the entire USGS record,(this was obviously pre-fracking), and was surprised to discover that the number of earthquakes was relatively consistent.. However there has been an exponential increase in intensity in recent decades. I agree. North Dakota wells are ALL fracked. They wouldn’t produce oil if they weren’t. 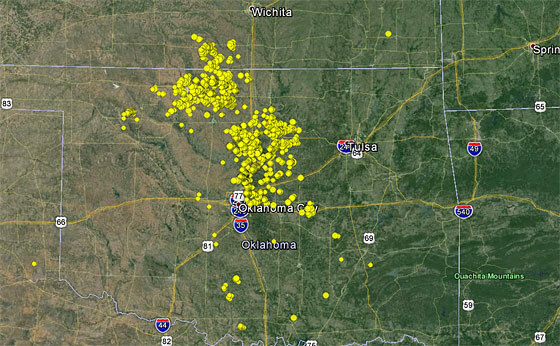 About the Oklahoma wells, check to see the depths that the quakes occurred at. A sizable amount are in the 3 to 4.3 mile depth. The amount of horsepower to create a frac at that depth is absolutely huge. Most fracing occurs at depths of 1 to 2 miles. I.e. North Dakota. I agree with idea of building a map that shows faults along with the swarms. It would be very interesting. Can’t find anywhere on the net where someone has done that. MapWindow GIS software or ESRI software. I live west of Tulsa. I worked in the Open Hole logging until a few weeks ago. The areas that are high lighted, there is no MAJOR fracing going on there. We’ve always had small quakes, its when they suddenly stop happening that I will start getting nervous. The small ones release pressure. 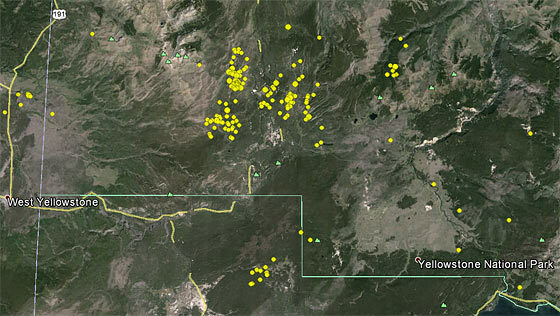 The wells that are in those areas run between 2700′-4500′ in depth, far short of the 2-3 mile depth of the quakes. One major thing we have going on here is drought and lack of ground water. We are missing almost 12′ of ground and surface water in the state. That is a a lot of weight and area to be missing from the sub structure of our bed rock. Our deepest wells are in far western Oklahoma along the Texas line. Some of those run 8900′-10,000′, they don’t run large fracing jobs on them. Ken, are you on vacation? hoping you are OK….miss you! Sir, I hope all is OK. Miss your daily posts! Still posting every day… try going to the home page and pressing [CTRL] ‘F5’ (at the same time) on your keyboard (which refreshes the browser cache) and let me know if the newer posts show up… I believe that something had gone awry with the coding shortly after this particular article, and some people are not seeing the newer articles. just to let you know, articles have been continuously showing up for me. Ken, I had the same problem with missing posts. A refresh or reload of the page seems to fix things. Thank you for Modern Survival Blog! I’ve learned so much from you and the friendly people who comment. Becoming a prepared citizen is a commitment of time, money, heart and soul. Your leadership is greatly appreciated. Good evening. I live near Stillwater, OK. I have felt no less than 8 earthquakes today alone. The jury is still out on Fracking causing earthquakes. They have been Fracking here for decades. Anyhow, it’s getting to be a bit scary. Look at today alone. 12 and counting over 3.0 and they are everywhere!